Every parent worries about the health of your child. Very often kids get sick with colds, and one of their symptoms is a cough. Is this bad? No. When you cough the body gets rid of the germs and unnecessary organisms. Good when coughing stands out phlegm. But if not, then you need treatment. In what diseases is cough, and how to calm him down? Cough can be treated in different ways, depending on its nature. 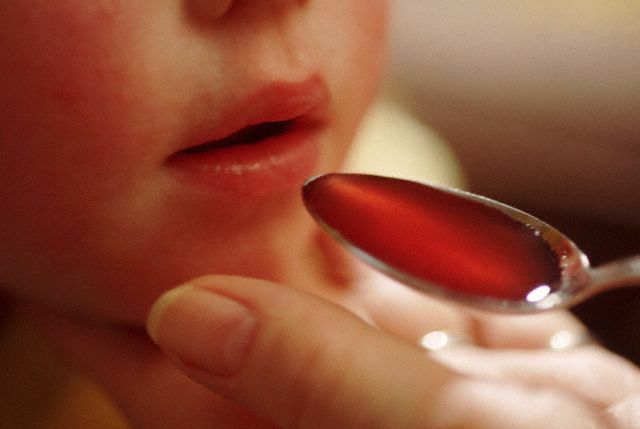 Basically, cough medicines are divided into three groups: 1) expectorants, 2) soothing a cough, 3) thinning phlegm. In addition to drugs needed to carry out the procedure: put the banks and mustard; RUB the chest. The task of parents is to do everything possible to cough was moist, and phlegm was otherlevels. With obstructive bronchitis. The mucus composition is very viscous, making it difficult to exhale air. Therefore, you first need to take medicines to liquefy the phlegm, and then expectorating. You must give your child to drink plenty of fluids and do several times a day massage. If the child is allergic, he can't put mustard. At tracheitis. In the beginning of the disease cough is dry and sputum is absent. So the first days to take mucolytic medications, and a time – expectorants. When sputum began to cough, the medication can be canceled and only do massage. Don't forget to drink warm liquid. In the absence of temperature can soar legs and put mustard. In viral pharyngitis. Cough frequent and dry. It is recommended to make inhalations with herbs, aroma oils. 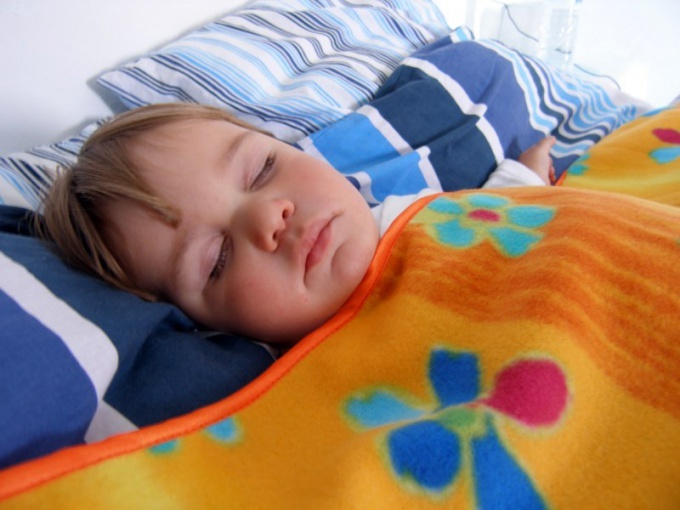 To cough not hurt the child to sleep at night, you can give the medication that keeps him calm. Prolonged cough. In this situation you need to go to the doctor and to hand over the clinical analysis of blood, because the causes of cough can be very different. It can cause even long-term use expectorate means. In whooping cough. The cough starts with a wheezing breath, paroxysmal and lasts for a few minutes. This cough can even trigger a loud sound or bright light. In this situation, the only suitable drugs, soothing the cough and the nervous system. During the year, even in the ordinary colds, cough may have pertussis. When false croup. The child must put in the hospital because in addition to phlegm, he still swells the mucous of the larynx. Until the ambulance has not arrived, you need to give a large dose of the mucolytic agent, abundantly drink a warm drink and open the window to ventilate the room. Cough can be of different origin and type. So, before you start treatment, you need to be sure that it won't hurt. Night cough in a child is accompanied by a number of diseases, exhausts it, preventing sleep, and in severe cases can reach up to vomiting. To alleviate the condition of the baby at home, if you deal with the reasons causing the cough, and choosing the right tools. Give your child before bedtime tea or heated milk. A warm drink soothes a hard cough. To cure this way the child will not work, but to facilitate his dream is quite real. Maintain adequate indoor humidity and average temperatures necessarily airing the room before going to sleep. Warm and dry the air you breathe in homes in the winter also causes of night cough have children. Cook in a pan the potatoes and let the kid breathe over the still hot broth. Such steam inhalations are already at school age, little children may just get burned, breathing in the hot steam too. It is necessary that the child breathed through the mouth. Use special inhalers after the child reaches two years. In this case the cough use inhalation with oils of tea tree and special medicines. Avoid inhalation just before sleep, as they help to facilitate expectoration, and in the lying position she continues to irritate the throat. Therefore, it is best to carry out the procedure a few hours before bedtime. RUB the chest and back child that is already laid in bed, warming means, the most famous of which is badger fat. Mustard and banks in childhood cough are not used. Despite the fact that the cough worsens quality of life and interferes with sleep, it is necessary for the body as it helps bronchi purified from bacteria, they are annoying. Without coughing they can descend into the lungs and trigger the development of pneumonia. 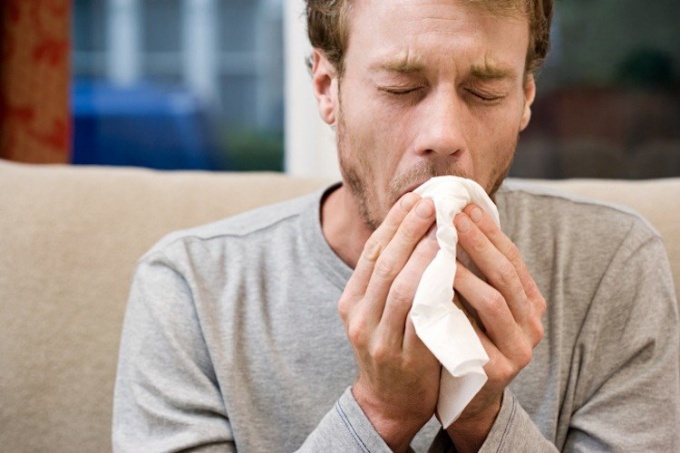 Before you treat a night cough, you need to understand the reasons for its occurrence. Night cough is exacerbated by the fact that lying is bad and dissipates phlegm expectorated, irritating mucous membranes and causing new attacks. Choosing a treatment method, always consult with your doctor to avoid complications. Sometimes not so much the disease itself exhausting the child and nursed him parents, how many sleepless nights, accompanied with exhausting cough. In such a situation should immediately consult a doctor, so he can establish the true cause of night cough and prescribe treatment. In some cases the cause of night cough can become allergic. Look closely to your baby. If the cough increase, just let him sleep in his own bed, begin to tear the eyes will be swollen, be sure to perform a survey of the crumbs in the Allergy centre. According to the results, you will be given advice on child care and, if necessary, prescribed a course of treatment. It is most often a viral infection is the cause of the cough. His aggravation at night is directly related to the fact that lying down is the accumulation of phlegm and to remove it, the kid has been coughing more often than it occurs during the day. Increased cough and helps dry the air in the room, and stuffy nose crumbs, forcing him to breathe through the mouth. To ease the child's condition, make the evening in his room wet cleaning, and a little before bedtime ventilate the room. Put the baby the higher the pillow, often change its position during sleep. This will prevent the accumulation of phlegm. Let's the child drink more fluids during the day. It is best for this purpose, you can use a warm decoction of rose hips, chamomile, tea with raspberry, viburnum, sea-buckthorn etc. Be sure to clean the nasal passages of the child before sleep: wash thoroughly special saline solution and ask the kid to blow his nose well, either remove the mucus from the nose using a small syringe. Instead of saline solution you can use the decoction of chamomile, thyme, marigold, mint (1 tsp per Cup of boiling water). Helps to unclog the nose juice of Kalanchoe. Press the juice of fresh leaves of Kalanchoe and drop his crumbs 2-3 drops in each nostril. Irritating the mucous membranes of the nose, the juice causes sneezing, as a result of which the nasal passages will be cleared. Make child (over six months) steam inhalation. In a small saucepan bring to a boil 250-300 ml of water, add the boiling water a tablespoon of pine needles (or kidneys) and after 3-4 minutes turn off the gas. Let the broth infuse for 7-10 minutes, after covering the pan with a lid. After the allotted time, bring her in the room to the baby, put it on the table (the chair) and remove the cover (distance from the bed to capacity with a decoction should be 60-90 cm). As soon as the steam coming from the broth will be warm, move the pot on a small chair near the cot (at a distance of 30-40 cm). With the help of diaper (nappies) send warm vapor crumbs on the face. The duration of this procedure, 10-12 minutes. No less effective inhalations with alkaline solution (0,5 teaspoons of soda in 0.2 l of water), and herbal decoctions on the basis of sage, fennel seeds, lime flowers, etc. (1 tablespoon per Cup of water). If the baby is awake, give him drink hot milk with honey. With a strong cough give prescription an antitussive. Watch carefully for the child. If all your efforts do not bring him relief at 2-3-day again, consult a doctor. Do not try to treat your child yourself. Be sure to coordinate your actions with a pediatrician. 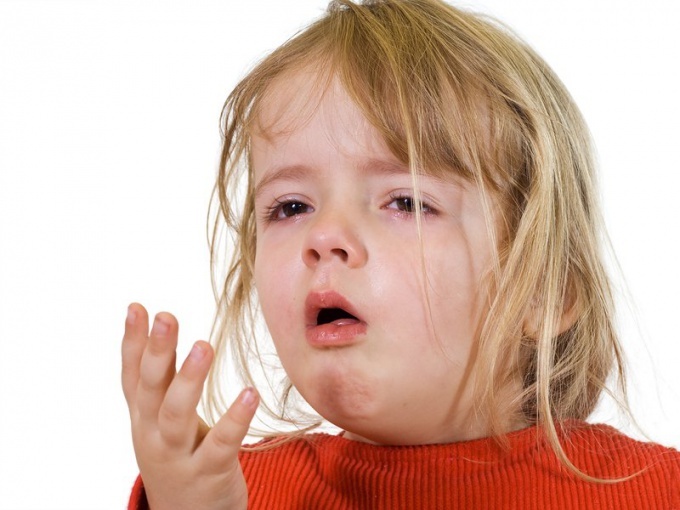 A dry cough gives the child serious discomfort. Often it causes severe pain and fever. Therefore, it is important to know how it can be calm at home. 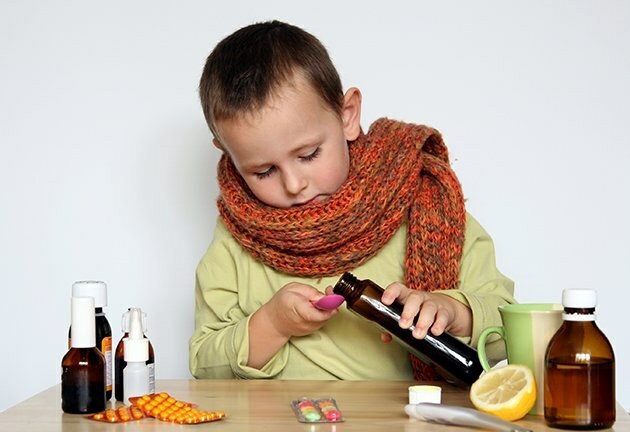 To soothe a dry cough in a child will help mineral water. It is necessary to give to drink little by little. It should be at room temperature. The content of iodine and silver ions is unacceptable. A glass of milk with soda effectively calms coughs. It is necessary to start a bit of heat. Then the glass is added 1 teaspoon of baking soda, which is mixed thoroughly. The mixture is watered child. If he doesn't like the taste, you can add a little honey. Give the child steam inhalation. It quickly soothes a dry cough. For its preparation you will need to take 4 tsp of baking soda and dissolve it in a liter of water. Boil the mixture and let the child breathe over the steam. It is desirable to cover his head and a pot of water with a towel to provide the maximum effect. Hot tea with raspberry is a salutary remedy for dry cough. His child should drink in small SIPS. It is desirable to give such tea not during the arrest and prior to their appearance. Then we can warn them and thus reduce painful sensations. Use proven method comprising drink hot hips. Rose hips should brew in a thermos. Per liter of water, use 10-15 grams of fruit. It is important that the drink has rested for 10-15 minutes. Drink it in during the attacks and before eating 20-30 ml. Use proven folk remedy to soothe dry cough based on cocoa. Take it in the amount of 1 tsp. spoons mix with 1 tsp honey and 1 tbsp oil. Mix thoroughly the ingredients, let the ready mix child in 30 minutes before meals for 1 tsp. To soothe a dry cough will help onions. Bake it, and then finely chop. Let the resulting mush to the baby in the morning on an empty stomach 20 g. At night RUB the chest and neck child grated raw onion. Anesthetics is very effective in dry cough. They quickly calm him down and relieve pain, as have a soothing effect on the mucous membranes of the respiratory tract. You can buy them at the pharmacy, but first consult the doctor he prescribed the necessary medication and prescribed dosage. The cough itself is very unpleasant, but when he bothers to sleep at night, it becomes almost unbearable. Of course, to solve the problem, you should try to cure diseases, symptom of which is coughing. However, the process was quicker and easier, you can use additional funds. Warm sweater, milk, honey, ginger tea, butter, pine needles, mineral water. In the evening just before bedtime hold the hands under running hot water for 5-7 minutes. Carefully RUB them, making sure that the skin from the fingertips to the shoulders well warmed. Then quickly dry the hands with a towel and put on a warm wool sweater. It is important to do immediately after grinding, otherwise the skin will have time to cool down. Then lie down in bed, drink a glass of hot milk with honey or ginger tea and try to sleep. It is important with no one to talk to not to strain once again the vocal cords. Read also desirable. Otherwise you can provoke another coughing attack. Take the radish, wash, peel it and then cut into small pieces or grind on a grater and add to the bowl along with the separated juice. In the resulting mass, add a little sugar, and then mix. Sweetened radish juice you need to drink 1-2 tablespoons every hour throughout the day. Be sure to take this "medicine" and at bedtime – over an hour and for half an hour. This remedy helps in the fight with the night cough. Boil a glass of milk and add 1 tsp butter and a pinch of baking soda. The resulting drink you need to mix and drink while it is still hot. Drink slowly, in small SIPS. Milk oil "coats" the throat, easing discomfort and relieving cough. Make a decoction of pine needles and inhale its steam. A good option for getting rid of night coughing – first breathe over a saucepan of broth for 10-15 minutes and then boil the liquid again and leave in an open container next to the bed. This method can relieve spasms, relieve pain in the throat and get rid of the cough. Well, if after inhalation you drink a glass of hot tea with honey or boiled milk. Be sure to make sure that the room is maintained in optimal humidity, especially if you are heating devices that dry the air. You can leave the room a pot of hot water or use a special moisturizer. Dry air irritates the throat and becomes an additional cause of coughing. Open the bottle of carbonated mineral water and leave it for 2-3 hours to gases gradually come out. An hour before bedtime, start to slowly drink the water. It will soften the throat, reduce coughing. This method is appropriate if we are talking about dry, not wet cough. When a person is sick, cough during the day, as a rule, does not cause any problems, unlike the night. During the night, or rather at midnight, is a strong aggravation of the cough, people can not sleep itself prevents sleep to your loved ones. And more suffer the children. The main cause of cough is considered to be a viral infection. It is absolutely impossible to treat with antibiotics – not least because the cough clears the bronchi and lungs. In the suppression of cough eliminated natural protection against serious bacterial infections such as pneumonia. If you are not able to see your child suffer and can't sleep at night due to severe coughing, in which case you should start to take action. The first recommendation is traditional: drink more water. The fluid not only to mitigate the cough, but will help remove phlegm. As a sedative helps a hot drink – milk with honey and butter, cranberry juice or herbal infusion of expectorant herbs. This drink will help to moisten the throat, thereby loosening the cough. The second recommendation is to keep the nose clean. Clogged nose will lead to the fact that the child will start breathing through your mouth, leading to dryness of the oral cavity and throat. To do this, before sleep, be sure to clean the nose of the baby and, if necessary, bury children's vasoconstrictive drops. Or rinse your nose with salt solution. The third recommendation is to lower the temperature in the room. The hot air in the room can enhance the cough and cool is more humid, which is necessary in this situation. Not only is the use of artificial devices for air humidification, as they are much faster breed bacteria and mold. The fourth recommendation is not to RUB the chest of the baby for the night. The ointment does not affect nocturnal cough, but inhalation of its vapors can cause pneumonia. 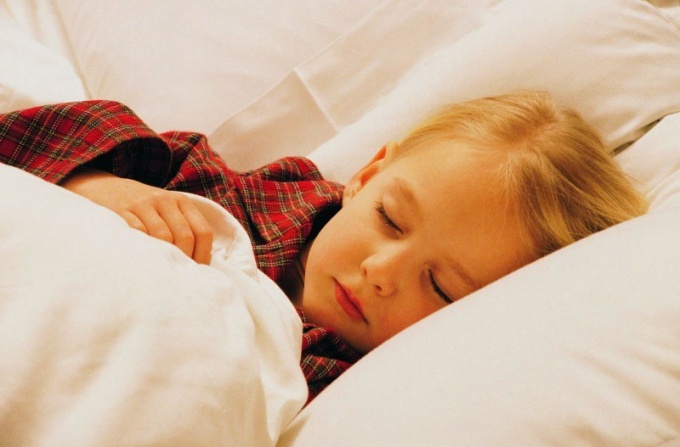 General tips when night cough child could be next. If you are absolutely sure that your baby has allergies, the cough should stop using antihistamines. But before applying make sure you read the user manual not to accidentally give a child an adult medication and precisely follow the dosage. If the baby does not sleep for several nights, try to give him drugs containing dextromethorphan and guaifenesin. These medications soften the phlegm and ease the cough. They, of course, will not give absolute effect, but this circumstance is considered an advantage, as they completely suppress the cough, is prohibited. Remember that giving the child up to 1 year potent drugs against cough is prohibited, as their impact may affect the breathing of the baby.